Since our front porch is pretty small, we decided to take off the railing to give us a bit more leg room (we also figured it would give us a better view to watch Ellie play in the front yard!). 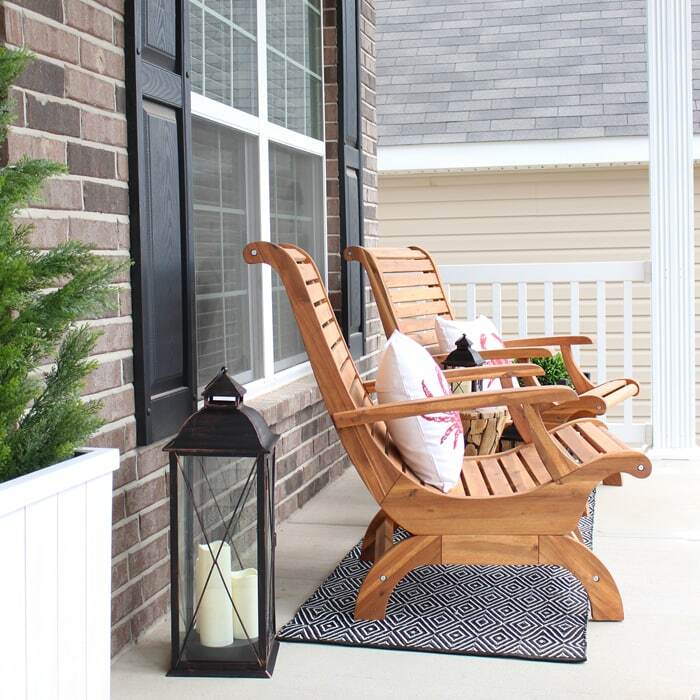 It only took us about 10 minutes to remove the railing and then it was time to design the porch with all of our new finds from Hayneedle.com. It feels like something straight out of a magazine for me. Exactly how I envisioned it! My favorite find was the Belham Living Adirondack Chairs. They were very easy to put together and I’m obsessed with the beautiful lines. We topped each of the chairs with Mina Victory crab pillow. I love the hundreds of little red beads that make up the crab and love that it’s a removable cover for easy cleaning. 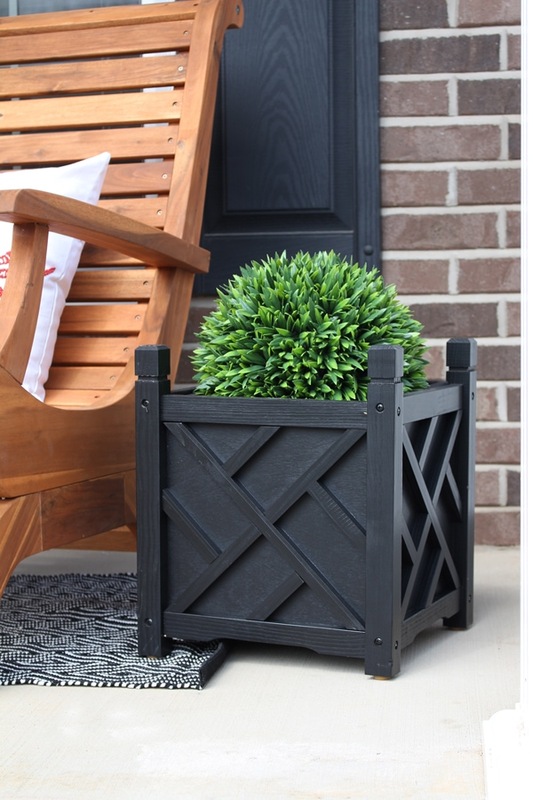 I wanted a lot of greenery on the front porch so I scooped up this black Chippendale planter box. 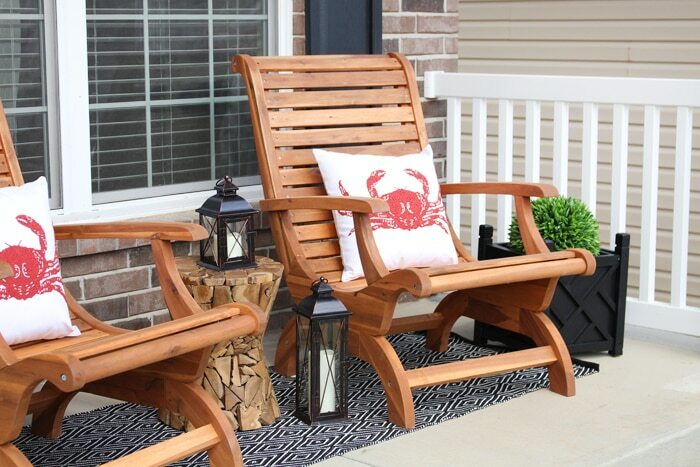 I’m thinking about grabbing some more of these in white for my back deck! In between the two Adirondack Chairs I put a little Teak garden stool. I’m totally obsessed with this piece. It’s the perfect size, too! I grabbed a set of 3 of Smart Design metal lanterns with LED candles. Two I placed near the garden stool and then the large one I placed closer to the front door. The battery operated candles will come in handy for late nights on the front porch gabbing with my sister or neighbors. 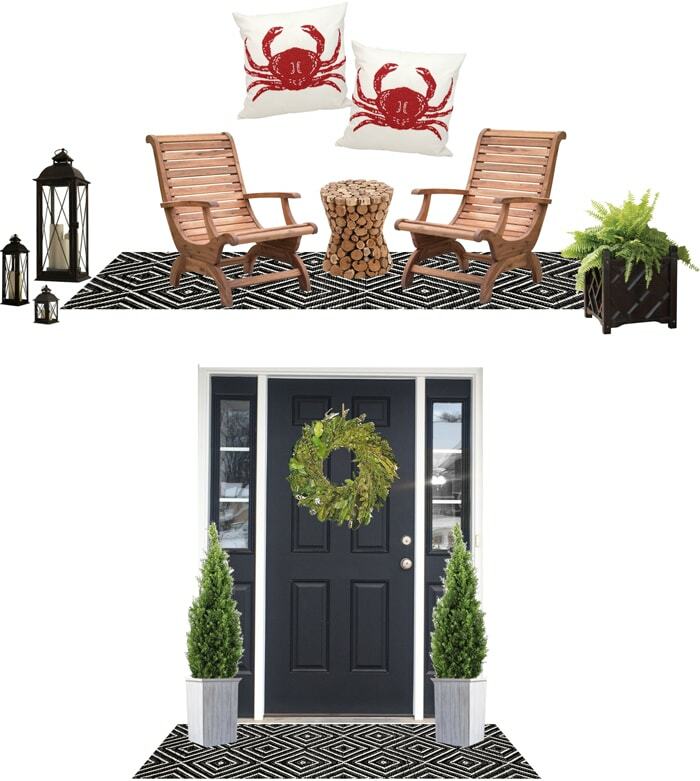 The outdoor rugs are black and ivory diamond Dash & Albert from Hayneedle.com. I put a 2.5 x 8ft one under the Adirondack Chairs and a 3 x 5ft rug at the front door. 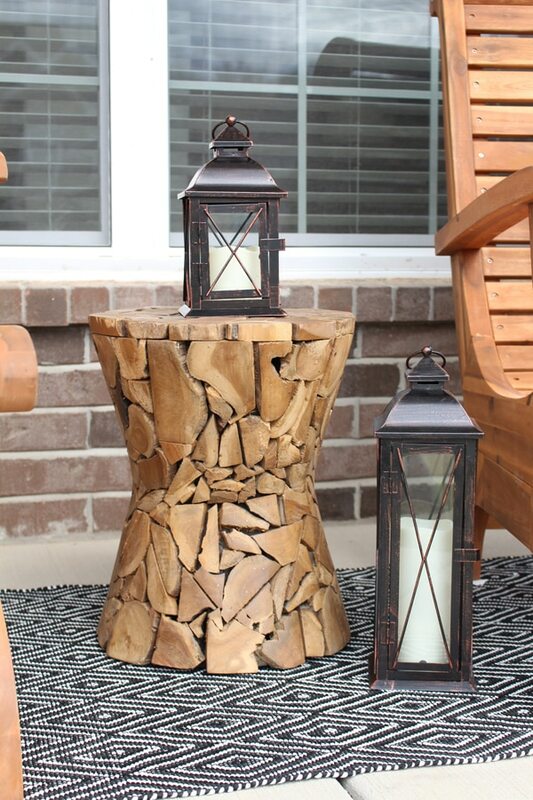 I quickly fell in love with these large Coral Cost Cape Maye weathered wood planters. They are HUGE, 18×18 bases! I filled them with 48 inch arborvitaes. Since I work two jobs and am always on the go with Ben and Ellie, I figured artificial plants were the safest bet for me. 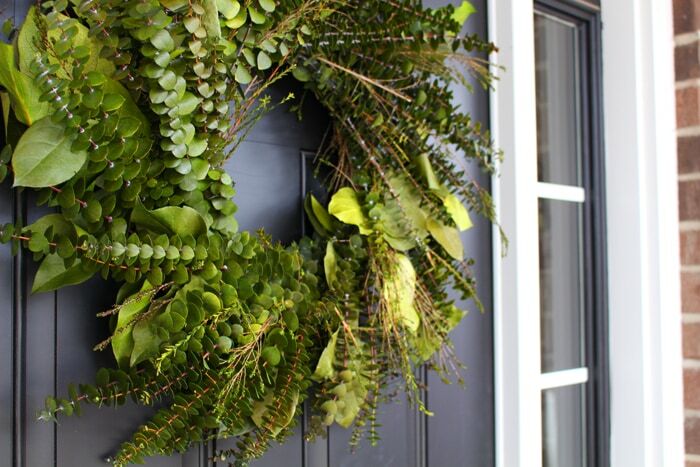 I found a beautiful 24 inch eucalyptus wreath from Hayneedle.com. The smell is absolutely incredible! Since we have a covered front porch that doesn’t get much direct sunlight this will work perfectly for our space. 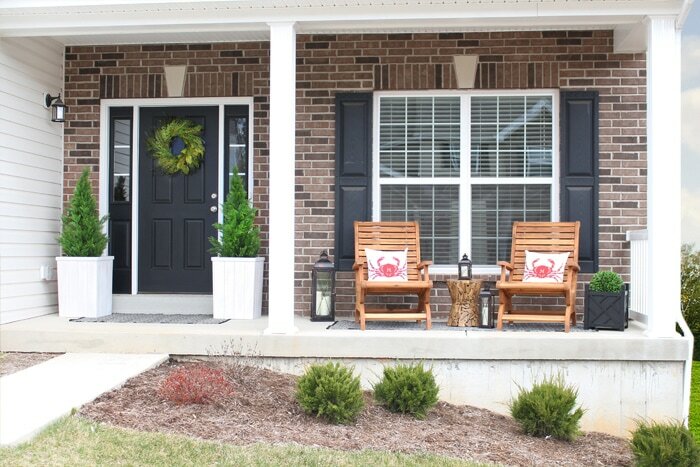 Well that’s it for the front porch makeover tour! 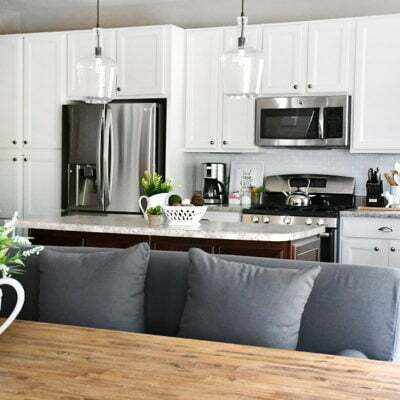 I’m completely in love with this space…. it turned out better than I could have dreamed! Now we just need the grass to green up and the trees to bloom, right? 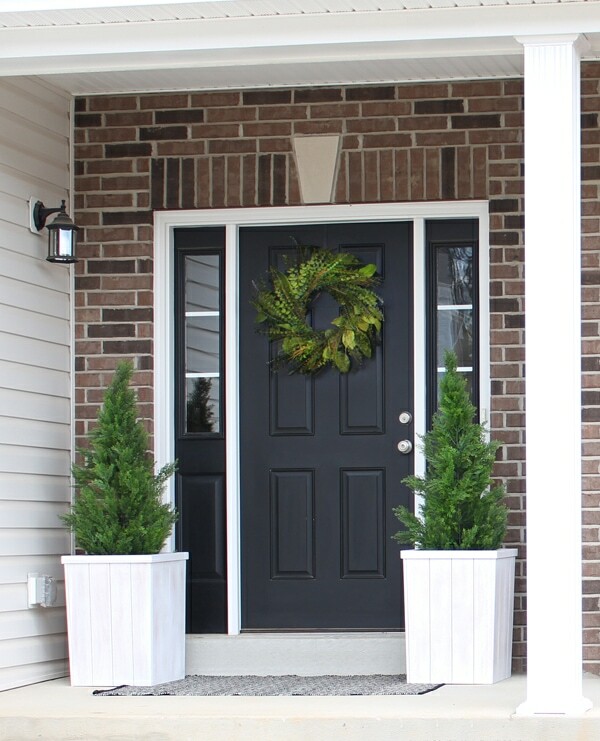 Great job on the front porch, Erin! What a difference just taking the railing down! It is a very comfortable place to sit and chat with the neighbors. Very nice! Love everything about it! Great job! I never would have thought to take down the railing. Now I need to check out hayneedle.com! Thanks for the tip! 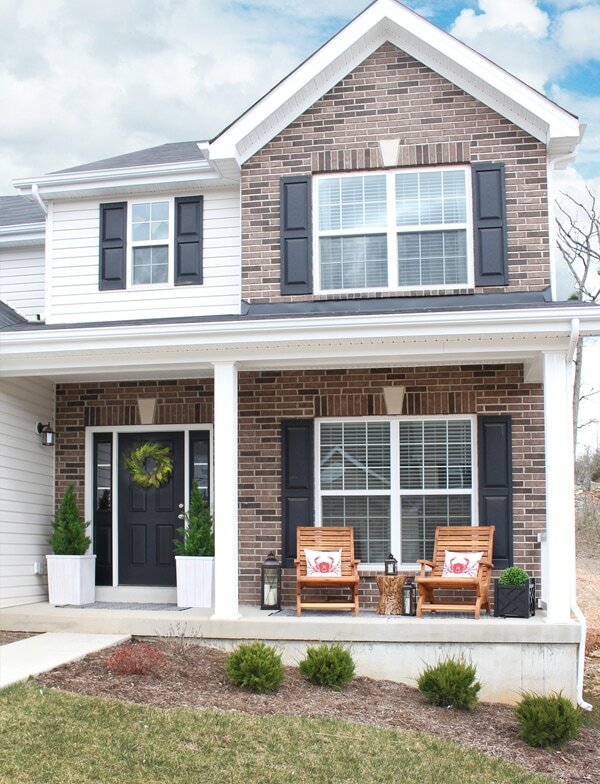 We just built a new house and put on a front porch very similar to yours. 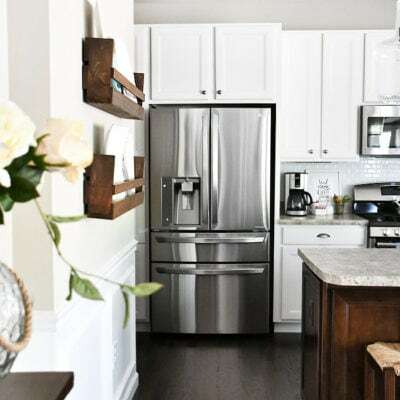 We chose to keep the railing off for the same reason – just felt more open to everything! 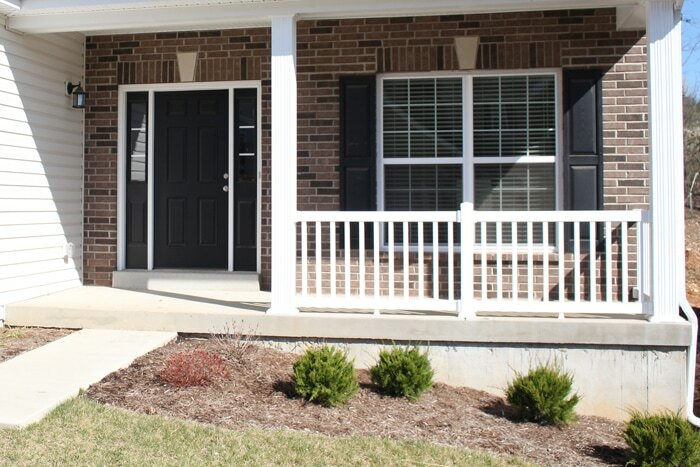 If I had a wide front porch that went all across the front of my house I’d keep the railings because I love that look. But with ours to one side like yours, we like the railing off for the open feel. 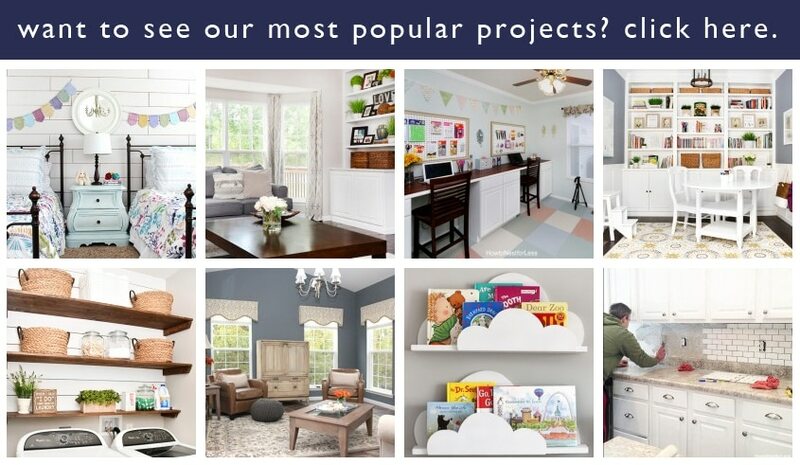 I’m so glad I saw your pictures of before and after because it just confirms our decision – thanks!! This looks so great! 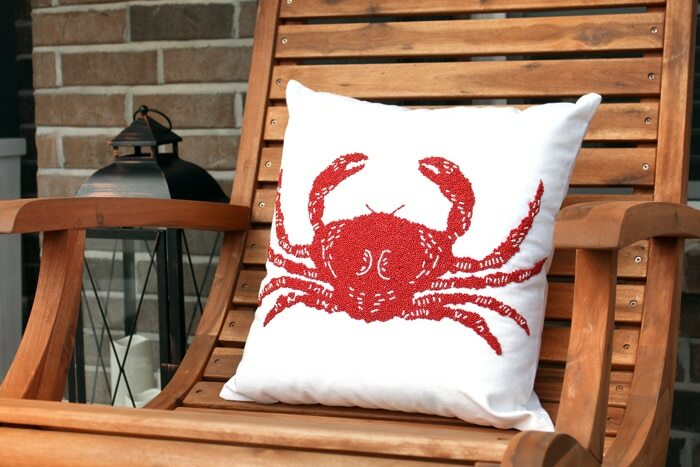 I love the pillows – the crabs are too cute and will look great through Summer. 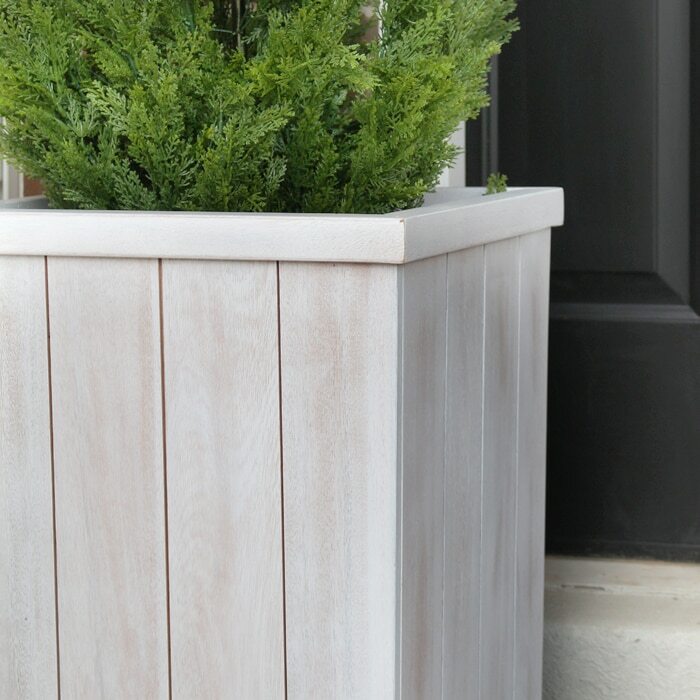 Question, what is the name of the plant that you put in the black Chippendale planter box? I love the rounded shape and I may have to get one for myself! Great job on the front porch! 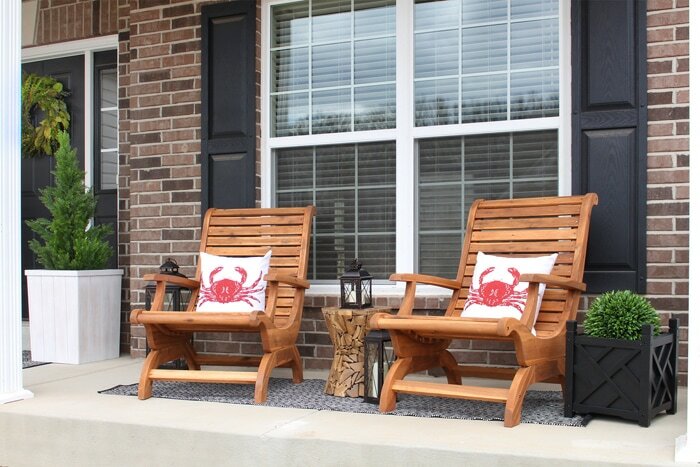 I love those chairs and have been looking for something new and different for our deck. I’ll have to check them out! What a fun front porch. Luv those cute coastal pillows and that little table is soooo cute! We would love to have you come party with us at our Show and Share Party. i love having greens, but i never thought to go faux with outdoors. those look so unbelievably real! 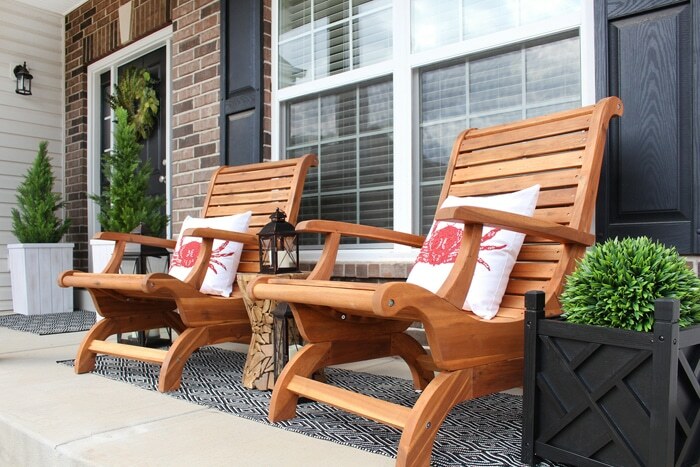 enjoy your porch! 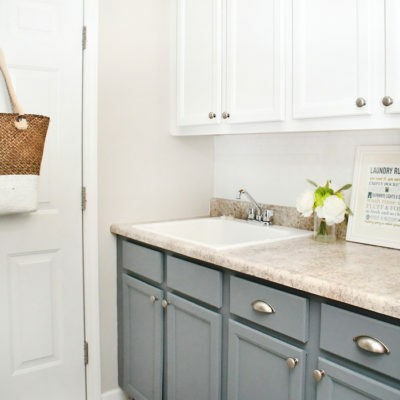 It’s amazing what a simple thing will do to change the look of a space. Love that you removed the railing and those chairs are awesome!